Tarpon are here and hungry. Lots of sun, fun and silver kings. It was a busy week with plenty of schools of tarpon pouring into our area. Boca Grande is full of silver kings and boats. Schools of tarpon have invaded area beaches. Some are even traveling up into Charlotte Harbor near the Big Pass. I talked with the “Fishin’ Magician” in Key West last week and he says they still have plenty of tarpon still down there. So we will have fish for awhile. We tarpon fished all week. I’m sure snook are ready to cooperate if you want to play with some. One captain said he found a few kings and another located a few cobia. It’s time for permit and cuda on the reefs. It’s great to be busy catching fish. Beach tarpon are our first choice and they cooperated most of the week. It was awesome early on and as expected got tougher as the other boats heard about the hot action. The Full Moon this week should be good fishing. Fish were eating crabs and greenbacks on both tides. Most captains are knowledgeable and considerate but it was much more challenging this past weekend. Some visitors just don’t know enough to understand that scared fished will not bite. Fish are already skittish after the sun brightens the sky in this clear water. We are cautiously staying off the fish with electric trolling motors but a few clueless novices come cruising in under two stroke outboard power; sending the fish off and running. Fortunately we can go find more fish that are still happy and hungry. We saw several big sharks this week. One was huge and the other only about eleven feet, both where hammerheads; not to be confused with the hard headed boaters. I had two couples on consecutive days, from the Detroit area last week and both of the ladies caught tarpon. Donna Fish, really, and Mary Beth Osoba both got their first tarpon off of Englewood Beach on live crabs. Donna’s fish was chased almost up onto the dry sand by the eleven foot hammerhead but escaped and we even got some photos of the successful tarpon release. 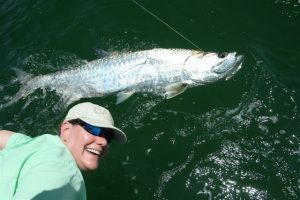 Mary Beth caught hers down closer to Boca Grande and had a time subduing the big tarpon. It is so much fun the share these memories and both guys enjoyed helping their ladies. Leigh, Shawn and TC flew in for two days of tarpon fishing and we landed a big fish for Leigh on our very first cast. We had bites, once three casts in a row, jumped and fought numerous other tarpon with mixed results the rest of the time. The bites came in spurts. They were great guys and I look forward to their return when they can.